To close the year of the horse 2014, we bring you horse stories from the “Bluegrass State”(a nickname based on the bluegrass found in many of Kentucky‘s pastures due to the fertile soil). We start off with Alona Demmers and a gelding named Cassidy. Shuffling through the archives of memorable horsey experiences in my head has once again reminded me of why I find the horse so endearing. Historically, horses have been the “sacrificial lamb” in the advancement of many cultures and civilizations, but personally, they have given me invaluable life lessons and evoke in me such extreme emotions that leave me feeling very alive… and addicted. Being in the presence of horses has been a privilege and a source of joy and adventure for the past 20 years of my life. Horses have been my friends, teachers, partners and fairly inexpensive psycho-therapists, provided that Vet calls are kept at a minimum. The bond I have with my horses is inexplicable and transcends words. As in any lasting relationship, trust is essential. It has to be earned by both horse and human and is nurtured by kindness, consistency, reliability and the ability to heed, understand and communicate the unspoken language. Of course, mistakes will be made and miscommunications will happen. Fortunately for us humans, most horses are fair, honest and innately compliant. When I think of these qualities, I am reminded of my gelding named Cassidy and an experience that he and I shared and learned about each other. My first introduction to Cassidy was in a barn in Michigan. He was busy eating some grain in a bucket and had no inclination to join the welcoming committee. He was 2 yrs old and I was 27 and a very eager novice with regards to horses. I must admit that I have a tendency to do poorly under pressure and Cassidy was a horse I purchased under a lot of pressure. I had not planned on buying him. He had numerous conformational flaws but he was thrown in as a consignment deal for a fairly cheap price when I purchased his mom. I signed the purchase contract while ignoring the insistent voices in my head telling me that no one would want the horse and I will be stuck with him for the rest of his life. Those voices were actually psychics accurately predicting the future. He was good natured, sweet, mentally slow and very, very lazy. He always found himself towards the bottom of the horse hierarchy and I found myself having a soft spot for him, mainly because he was at the bottom of the totem-pole. He learned how to accept a rider at age three and the whole process was pretty stress-free since the trainer we hired took the time to introduce the steps slowly. In spite of all the care we put into his training, Cassidy was a reluctant participant in the arena. I always believed that he was just so lazy that any type of work was met with unwillingness. Nonetheless, I tried to convince him that it really wasn’t that bad and he got rewards in the form of a processed, carrot-flavored-horsey-candy. Our rides were always a discussion, with me asking one thing and him having other ideas. During one of these rides, my husband Eric, had pulled up in his truck which was loaded with horse feed. I instructed him to not feed the horses since I was still working with Cassidy and I didn’t want him to think that he was missing out on dinner. Eric started unloading the feed bags and the other horses congregated by him, giving the appearance to Cassidy that feed was getting distributed while he unfairly had to work in the arena. In the middle of a trot stride as I was coming down on the saddle, he decided to have a tantrum, a giant hissy fit in the form of two big bucks and a bolt. The first buck threw me forward and the second one put me on his neck. I knew that I would not be able to pull myself up and I was dreading what he would do once he reached the end of the arena which would have been in a few seconds. I decided to abandon ship and jump off of him, landing flat on my belly and tasting a handful of sand. As I looked up, he had already turned around facing me, standing very still and alert, ears pricked forward, standing square with a look of surprise on his face. I am pretty sure at this point that he had put two and two together and since no one has ever fallen off of him in the past, I don’t think, throwing me off was his intention. I think he was surprised to see me on the ground. I walked up to him without saying a word. I led him to the mounting block and got back on. I can only surmise his thought process but he gave me the best ride ever. He moved forward with energy, listened, waited for every aid I asked and willingly obliged. I never thought that this horse even had the ability that he showed me that day, after his tantrum. I had a different horse. He was trying really hard to focus and please. Since punishment was never a part of his training, I could not entertain the thought that he believed he was in trouble and was fearing the consequence. I do believe that he felt remorse for his behavior, and he wanted to redeem himself. I will never truly know what motivated him but the ride was a wonderful gift for which I was very grateful. I worked as a CFO for 15 years for a direct mail company that was founded by myself and my husband, Eric. I am currently a managing partner at Future Swell Enterprises, LLC, a commercial real estate business which was also founded by my husband and myself. 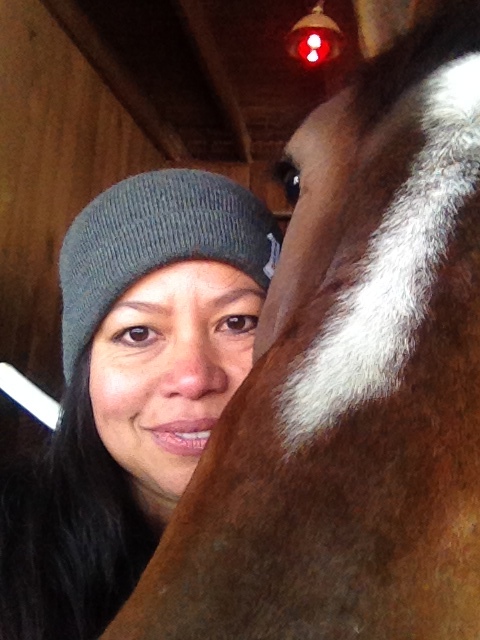 I am also a managing partner at One Cow Farm, LLC and Rags To Riches Racing Stable, LLC. Both were co-founded by my friend Gemma Ziegler, her late husband, Vince, my husband Eric and me. I have been with horses for the past 20 years as a student, breeder, riding instructor with the 4H and a mediator between horses and owners who are having communication issues. 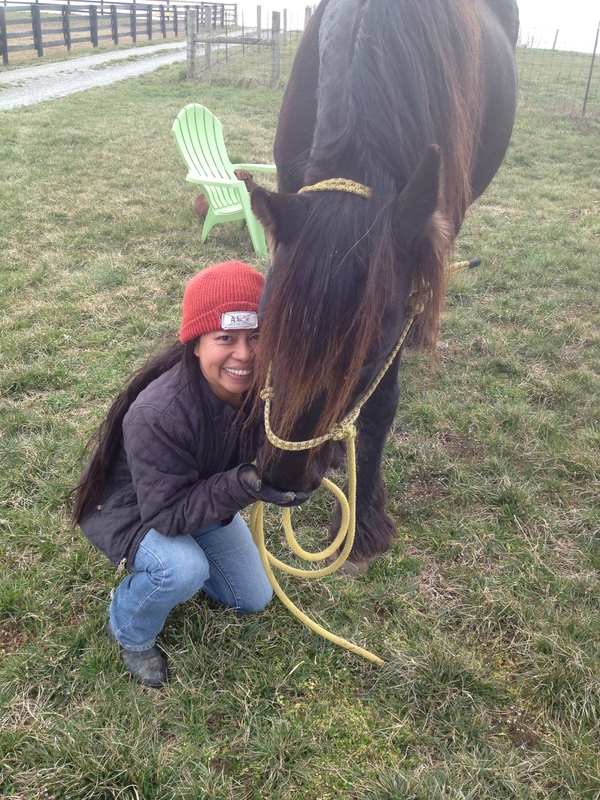 Thank you Alona I have seen your commitment to your horses and friends. 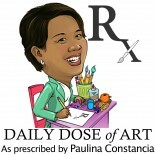 This entry was posted on December 28, 2014 by Paulina Constancia in Care, Communicate.